Alliance Bank of Arizona – Artworks PHX – a business-arts campaign in Phoenix, Arizona USA. Capturing Arizona’s history of economic development in a stunning photos, creating artistic work spaces. At Work in Arizona frames the story of our state’s economic history over the past century, through the lens of the men and women who built it. As the last of the continental forty eight states to join the Union on February 14, 1912, Arizona has in many ways mirrored the immigrant story of our country. Adventurous, hard-driving people from virtually every corner of the globe have moved here in a steady stream, swelling the population from around two hundred thousand at statehood to more than six million residents today. 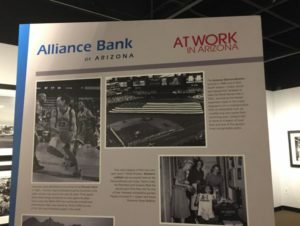 From its opening in both Phoenix and Tucson in early 2003, Alliance Bank of Arizona embarked on a trajectory of impressive growth. A decade later, at the end of 2013, Alliance had built more than 3.2 billion dollars in total assets with more than 2.5 billion dollars in loans outstanding, emerging from the national financial crisis as Arizona’s largest state-headquartered bank, ranking seventh in overall deposit market share among more than sixty institutions doing business here. This record growth is rooted in Alliance’s deep understanding of, and commitment to, Arizona’s economy. 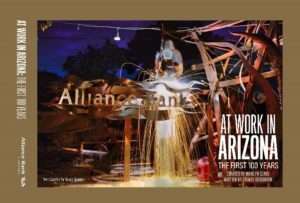 While promoting economic development in Arizona since its founding, Alliance Bank of Arizona published the limited-edition book At Work in Arizona—a photographic chronicle of Arizona’s first one hundred years of business. The book is dedicated to raising dollars for some of Arizona’s best education-focused nonprofits and is available with donations of $100 or more. 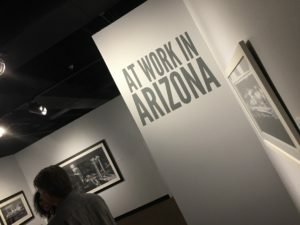 Curated by Marilyn Szabo and written by Stuart Rosebrook, At Work in Arizona frames the story of Arizona’s economic history over the past century, through the lens of the men and women who built it. Organized by key business sectors and vital industries, At Work in Arizona makes the point that in order for the next 100 years to be as remarkable as the first, more investment in education needed. From the cattle stock exchange to the Concorde, At Work in Arizona blends past and present to showcase the cultural and economic heritage of the state. 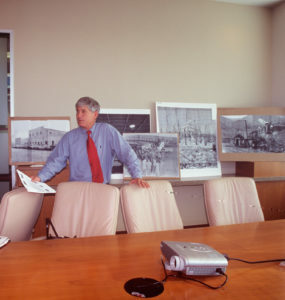 The idea came about when Jim Lundy, (featured in the photo to the right), founding Chief Executive Officer of Alliance Bank of Arizona, commissioned Szabo in 2003 to fill the bank’s walls with art depicting the history of commerce in Arizona. In addition to Szabo curating a collection of photos displayed in Alliance Banks throughout Arizona to foster a creative work environment appreciative of the state’s rich history and cultures, Rosebrook, a historian and former associate editor of Arizona Highways Magazine, was commissioned to write the book and tell the back story of each photograph. Today, this 168-page book highlights more than 212 historic photographs from Arizona’s statehood until today, assembled into a stunning pictorial essay. At Work in Arizona is available at Alliance Bank offices throughout the state and is exclusively featured at Arizona Storytellers in partnership with Republic Media. See www.next100years.org for more information. 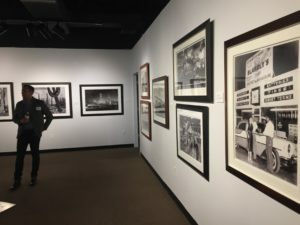 Photos provided by Marilyn Szabo, At Work in Arizona Curator.